For a young college girl, conforming to the plans her conservative catholic parents had for her, was something Steffina couldn’t stomach. She was her own person and wanted to live life the way she deemed fit, something her parents could not understand. Living away from home in a boarding school is perhaps what moulded her into the self-made and independent woman she is today. “Come to think of it, the distance between me and my family, the disapproval and disconnect is what changed me as a person. I became more outgoing and lively, a quality I didn’t share with my family,” says the 24-year-old. Steffina was more affiliated to the arts and ended up scraping through her science degree, eventually taking up a course in something she thought would serve her career goals better— Mass Media. That’s where she met her partner, Aditya, an independent filmmaker and cinematographer. Their’s was a friendship turned romance. While her parents didn’t approve of her lifestyle, they did leave her to her ways. But trouble began to surface when it came to the hours she kept, and unpleasantness started to creep in. “Midway through my final year of college, my lifestyle began upsetting everyone at home. This made me stubborn and I decided to leave. I moved in with Adi for a few days before his parents helped me find suitable accommodation,” she says. Living on her own obviously meant having to support herself, too, and she took up a job at a call centre. This meant late nights, early mornings and sleeping in between lectures and calls. Her only solace was the incredible love and support she got, emotionally and financially, from Aditya and his parents. Eventually, she moved back in with them. However, with graduation and the job hunt, her comfortable little world would soon be altered. “Adi went to the Philippines to study filmmaking and I moved back home after my parents asked me to, and started looking for jobs in the film industry.” However, the tension at home continued to grow because of her lifestyle choices and she was forced to leave, yet again. “I lived in a friend’s house for a few months, and assisted a few designers. I explored art direction further, which eventually lead me to production design. Before I knew it, one year had passed and Adi had finished his course and was coming back home,” Steffi narecalls. “Of course, when Adi went away, our relationship fizzled out, but we wanted to see if there was still something between us. That’s when we made a trip to Bali to make our reunion special. We weren’t surprised when sparks flew as soon as we met,” she admits. Before they knew it, everything was back to the way things were. Steffina was home with Adi and his family, and they picked up right where they left off. Nothing had changed except for one thing—they didn’t believe in the institution of marriage, but they knew they wanted to have a baby together. Aditya was looking for work then, but despite not finding anything suitable, he was certain he wanted a child. Eventually, work found him, which took him back to the Philippines and the pair decided to part ways. 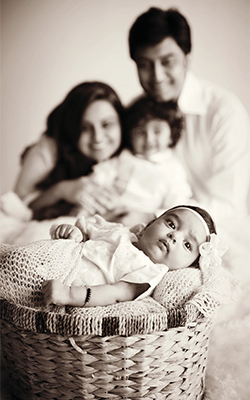 Aditya and Steffi na began going for regular checkups together and began preparing for the baby. But as the days passed by, pregnancy hormones began flowing in, morning sickness and mood swings followed, and they would end up fighting. Eventually, they decided to call it quits. “I decided to move out of the city and live in a peaceful environment. I knew a place up North where people would not judge me and I could live a simple, inexpensive life. Adi was confused and wanted to get out of Mumbai for sometime. He found work in Bengaluru and left. A few weeks after he moved away, I began packing for the North. That’s when his mother called me and insisted on taking care of me and the baby. I was uncertain because of the constant bickering with Adi, but I figured since he wasn’t around, it wouldn’t matter,” she says. While he was away, Aditya and Steffina stayed in constant touch over Skype. But it was his mother who was her constant source of support and comfort. “Adi’s mother took care of my meals at home. She made sure I ate a healthy, balanced diet of ragi, rice with starch water and ghee, tomato juice, etc. Fish and meat was also included in my diet. At the start of my pregnancy, I would take calcium and iron tablets, but Adi’s mum gave me replacements for them as well. Milk, and fish, for calcium, and green veggies for iron,” she elaborates. Of course, a healthy diet and an active lifestyle kept her strong throughout her pregnancy. “I practiced yoga and meditation for all nine months and strictly avoided outside food, alcohol, tea and coffee,” she says. Her healthy lifestyle was probably what made it easier for her to take a trip up north in her third trimester. Since Aditya was visiting Mumbai for a few days, the pair made a trip, and even ended up going on a seven hour-long trek in the mountains. MY HAPPY FAMILY Before Zoya came into our lives, my husband and I considered ourselves a rather fun-loving and happy couple. We’re both working professionals and have the perfect balance between our independent lives, and our life as a married couple. We didn’t want for anything—we’re both self-suffi cient and our world was perfect…well, almost. We realised that something was missing and that’s when we knew it was the right time to introduce a new member to our family. Now, we’re both in our 30s and never considered that conceiving would ever be an issue. We’re young and healthy and like other couples our age, we decided to go the family planning route. But life can be quite surprising, and despite tbeing young, we did experience a little bit of resistance when we were trying to conceive. It was only after a few months of trying, using an at-home ovulation kit, and carefully planning that we were finally successful. The day I announced that we were pregnant, Mohammed was elated. All those months of waiting and wondering were finally put to rest. We were going to have a baby and our happiness knew no bounds. There is one memory I will cherish forever—watching my husband the man of the house, melt and turn to putty when he heard the news. I like to think of Mohammed as my partner in crime. But more than that, he is my rock, my pillar, my support and my constant source of strength. 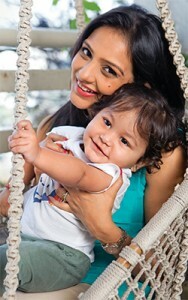 While I was pregnant with Zoya, he was no different. In fact, in those nine months, we grew closer. During my pregnancy, I experienced not only physiological changes, but psychological changes as well. Mohammed was with me every step of the way. There was nothing he wouldn’t do. Watching the man I love grow into a father was indescribable. I vividly remember the first time we went for my check-up. Mohammed’s eyes lit up when we saw a 4D sonography of our baby. Watching our baby growing within me, and hearing her heartbeat only reinforced that excitement Mohammed and I were experiencing. Our baby wasn’t here yet but we already felt like parents. I, of course, still went in to work. Balancing work and my pregnancy was worth it. After all, I did have my pillar to rely on. There’s not a moment that went by that I didn’t relish. There’s not a moment I would trade—fatigue, morning sickness, challenges while travelling, various discomforts— every moment has been a magical experience. Then, when Zoya was ready to come meet us, I was rushed to the hospital on the morning of August 17, 2015. Like most women, my delivery wasn’t planned. My water broke and I remember the blinding pain of contractions while I was wheeled to the delivery room. Perhaps it was all those baby books I read, or common sense, but I did have my baby bag packed with all the essentials I’d need to help me during my delivery well in advance. I had a checklist to tick off and made sure I carried everything required with me to the hospital. All I had to do was grab my bag. Now, let’s get real, having a baby is painful. Ask any mother and they will tell you exactly how traumatic the whole experience can be. For some, it feels like a crushing weight upon their bodies. For me, it felt like all my bones were being broken, one by one, very, very slowly. 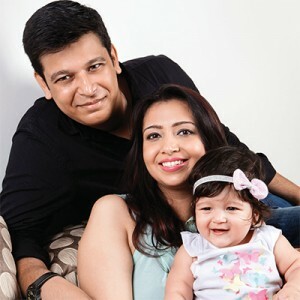 Initially, I had opted to have Zoya through a normal delivery, but I couldn’t take the pain and I asked for a c-section. Even though it was a comfort to have my mother with me in the delivery room, I missed having my husband holding my hand, as Zoya made her way into this world. A physiotherapist by profession, I am happily married to Rishi Daryanani. Two years into our marriage, on a New Year’s day, on our way back from Khandala, I told Rishi about my desire to have a child. Although Rishi is very understanding and has always unconditionally supported every decision of mine, convincing him to have a baby was the hardest. Like most men are wont to do, he weighed out his freedom versus the responsibility of fatherhood— fortunately, the latter won. After six months of constant arguments and fights, we finally went in for our preconception visit, took the essential tests, started with the multivitamin course and at last got a green signal from the doctor to start planning for a baby. Thanks to these complications my career had to take a backseat. On the positive side as we knew Krishnav will be arriving early, we started our preparations. I did a lot of reading while on rest. My physiotherapy books, medical journals and patient case files were replaced by mother and childcare books. Each morning began with a ‘to-do list for the day’. 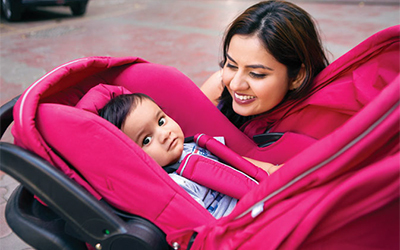 Rishi did all the running around for everything that we needed—right from clothes and toiletries to diapers, blankets, pillows, bottles, nursing clothes, diaper bags, to a crib and bath tub, he handled everything with fi nesse. The neighbourhood baby shop became his favourite hangout. He went there every morning and evening. In the morning, he would go there to buy the things that I had put down on the list, and during the evenings, he would head there again to exchange all the wrong stuff that he picked! The traditional and customary things were taken care of by our parents and friends. They were a huge support. In fact, we had everything ready about a month before Krishnav’s birth. During the winters of 2013, Deepshikha was miles away from home, in London when she missed her period. She recalls, “We were shooting for Humshakals on the outskirts of London. Dhiraj was in Germany for work when I did a home pregnancy test. 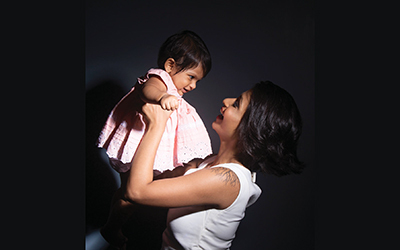 At 33, Poornima Kartik Iyer discovered the sweet and sour taste of motherhood. She talks about how when she finds herself taking a tumble, son Kiaan keeps her steady on her toes! I joined the M&B team before the first issue was launched. I had enough access to our UK archives to get a gist of what goes on in the world of mothers and babies. My journey with the magazine taught me a lot. 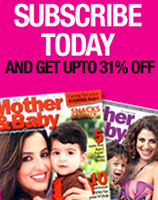 M&B is and has always been such a fun and informative guide for parents to be and parents of newborns and toddlers. After three years of marriage, we decided it was time to take the plunge. We consulted a gynaecologist, got all the necessary tests done, timed the ovulation like clockwork and voilà! We were pregnant and it was by choice! Now the first trimester wasn’t the best time of my life. No, I had no nausea but I was lethargic to the core. I am sure I could have beaten a sloth to it any day. I wasn’t allowed to move around much, thanks to a hyper husband who ‘wasn’t going to take any chances’. I, for one, couldn’t accept this restricted situation but what choice did I have? It felt like the burden of a ton of bricks was on my back each time I tried to get on my feet And then the second trimester dawned on me. Oh, the sunny side was up and now I was a completely new person. I was bright and cheery, more active and lively. The bump was sprouting and I was super excited. The husband made up for the three month constraint by whisking me off to Bali for a babymoon. A relaxed holiday is just what I needed and spa, shopping and uncontrolled feasting made up for the hot and humid Bali weather! The second trimester was also a super special time as I had two baby showers— one was a traditional valaikappu and the other a surprise shower hosted by my sister Smita, who got together with my friends and planned every detail— decorations, food and games. Both were fun and I am thankful to my family for all the pampering. I looked forward to my ultrasounds, and hearing the foetal heartbeat always gave me goosebumps. The baby was as pumped up as I was 😉 The third trimester was a breeze and now it all came down to waiting for D day. So while I was waiting, I continued with prenatal yoga and some R&R (reading & research). 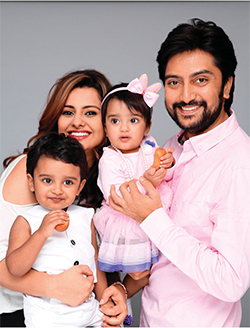 NEHA Shah, former preschool teacher and now mum to 16 month old Vansh, met husband Hemal Shah through an arranged setup four years ago. They soon were married before they realised it. And, as is typical in Indian families, pressure started building up from the family. Relatives would often ask the couple about when they would get to hear the ‘good news’. Hemal and Neha, though, were in no hurry. The couple was keen on settling down and getting to know each other before they brought another life into their little world. Two years later, and after several considerations, they decided to take the plunge. Parenthood was on their minds now. For most mothers-to-be, the first trimester is the most difficult time of the pregnancy, wrought with uneasiness and discomfort before things begin to ease out in the second trimester. 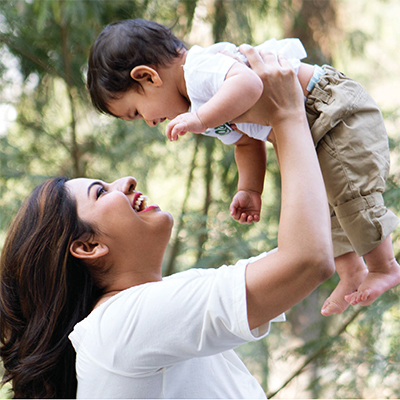 For Neha, the discomfort stretched all the way to the beginning of the third trimester. “I was constantly nauseous, and specially sensitive to strong-smelling perfumes and cabbage. 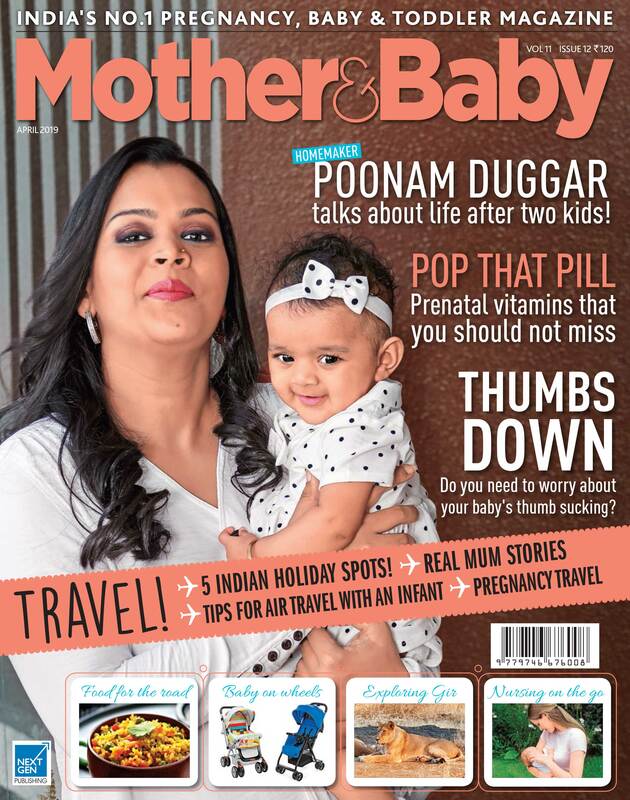 Acidity was my constant companion throughout the pregnancy, and I never really had any food cravings,” says Neha. The good thing, says she, was the fact that she suffered no mood swings at all. Neha kept herself fi t and active by walking and climbing the stairs. She seemed to have taken a preference to home-cooked meals, so that helped keeping her nutrition intake healthy and hygienic. “I continued being involved in daily household chores that kept me busy and active. I read a couple of pregnancy and mythological books as well,” she reveals.